Jane UK antwortet: Yes, any 'Matrix Light 2' is compatible with the Matrix Isofix Platform. Matrix light (the original Light version) and older Matrix Cup and Matrix Pro's are not compatible with a base. Hi, is this ISOFIX compatible with the "Grand" Car seat? I currently have the matrix light 2 set and looking at what car seat to get next that falls within group 1,2,3 but at the sametime compatible with this current isofix base. What is the total length of the Matrix Light Base leg? Jane UK antwortet: Hi Jo, The leg, when extended to its max, is 47cm. Will this isofix work with Jane matrix cup as well as the light? As I have the older vision and didn't wanted to mess around ordering it if wouldn't work. 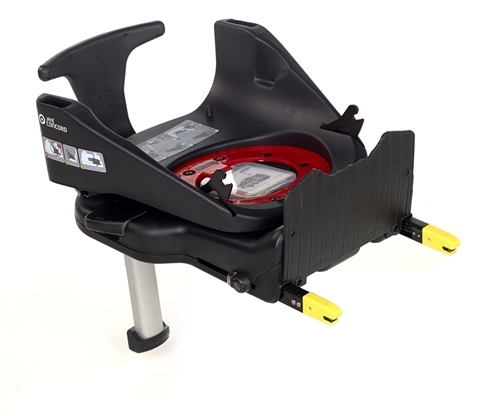 Jane UK antwortet: Good afternoon Thanks for getting in touch with us, I have had a look into your enquiry but unfortunately the Jane matrix Isofix Platform is not backwards compatible, the base will only fit the Matrix Light 2 model and not its predecessor's. The Jane Matrix Light 2 had a few structural housing's added onto the back for the support in the base, while the earlier models do not have these. Jane UK antwortet: Hi Lorraine, Thanks for getting in touch, hopefully I can help! The Twone systems are really popular because they are so versatile. The Matrix Light 2 really is a exceptional seat and used with the Platform its really handy too. The Matrix Light 2 can be fitted in the car either lying flat or upright, using the cars own seat belts or using the Isofix Platforms - the platforms just make it incredibly quick and easy to fit and change between the two. The Matrix takes up 1 space when used upright rear facing, and takes up two spaces lying down flat (the same whether the seat is fitted by the cars belts or on the platform). So either way (unless you have a 7 seater) you will be able to fit both car seats at the same time certainly but will only be able to have one seat lying flat at a time. In cases like this its best to use one seat lying flat and one upright, then after around 2 hours (for a really long journey) swap, so that the baby who was sitting upright can now lie flat. Using the Matrix Platforms this is really, really fast and easy, that's the beauty of these platforms - you wont need to take the harnesses off, waken the children or remove the Matrix seats themselves. I hope that helps Lorraine, but if your still unsure please do drop us a quick e-mail. Hi there, does this base need to be professionally fitted? Or will we be able to fit it ourselves? Jane UK antwortet: Good Morning Hazel, Thanks for getting in touch, hopefully I can help! No, you can certainly fit this yourself, there's absolutely no reason why you can't. It is designed to be fitted at home with no prior experience and this particular model actually has a little QR code on the front - so if you scan this with your smart phone and it will actually play a little installation video so you can see how this fits in your car, but its really not difficult at all. The two Isofix bayonettes will snap into place when they find the right point on your car and the little indicators will change from red to green on the legs. The new 2014 models that we have in stock (this version) also have an indicator on the drop down support leg too, so you can be assured peace of mind. There are a number of other upgrades on this model over last years design also. But you should be able to fit this yourself with no problems at all! I hope that's been some help! Jane UK antwortet: Hi Pei-Theng, I have checked Jané's compatibility list and it confirms it can be installed with either seat belts and with the Isofix Matrix Platform, in both positions (sit-up and lie-flat). For your information, the Matrix Light 2 car seat is classified as UNIVERSAL, and the ISOFIX PLATFORM is classified as SEM-UNIVERSAL. Hope this helps. Jane UK antwortet: Hi Paula, The list provided is only showing what the Manufacturer has tested and fitted the car seat physically in, and obviously up to that date of manufacture. Its is constantly being updated. So if it is not on the list, it doesn't mean that it will not fit, just that they may still have to try that model and year of car yet. I have looked into it, and the only things to check your car for it that it does not have an under-floor storage compartment that the Matrix Platform leg would rest on. The Platforms support leg has to rest on the solid car floor. And also check that there is no obstructions/dangers in the middle of the two centre seats if your rotate your matrix to the flat position which would hangover the centre gap. As you have already purchased the base, try installing it as per the instructions. If you have not come across any issues during the installation, then its fine. Its just a case that it may have not been officially checked by their installation team and added to their list yet. Hope this helps. Jane UK antwortet: Hi Katrina, The matrix platform only works with the Matrix Light 2 infant car seats. Having a base for a car seat is only useful with the infant age range of car seats. The next stage car seats stay in the car because your child and the car seat start to become too heavy to take in at out of the car and you only ever did this to put an infant car seat onto a pram chassis to make it a travel system. Once your child is passed this newborn age range of car seats, they start to use the pushchair and their car seats stay in the car. Hope this answers your question. Hello, I was wondering if you could tell me if a Honda Civic is listed as compatible with this isofix base? It has isofix anchor points and no underfloor storage, but I was just hoping to find out if it has been successfully tested in this car? Thank you. Jane UK antwortet: Hi Siobhan, yes the Matrix Platform has been tested in your car and I can confirm the two positions it can be used in is your two outer rear seats. I confirmed this with the list we have. Hope this helps.